Bacteria interact with each other at the microscopic level, communicating where and when they should search for food. In this collection, strains of Paenibacillus and Salmonella, known to cause a variety of diseases such as food poisoning, typhoid fever, and bacteremia, are allowed to grow and spread on Petri dishes. The patterns emerge from an initial population of bacteria that swim outward through an Agar gel using their motorized tails, creating the equivalent to a microscopic traffic jam of bacteria. The Petri collection is a set of porcelain dishes created by Bernardaud that Vik Muniz and Tal collaborated on. 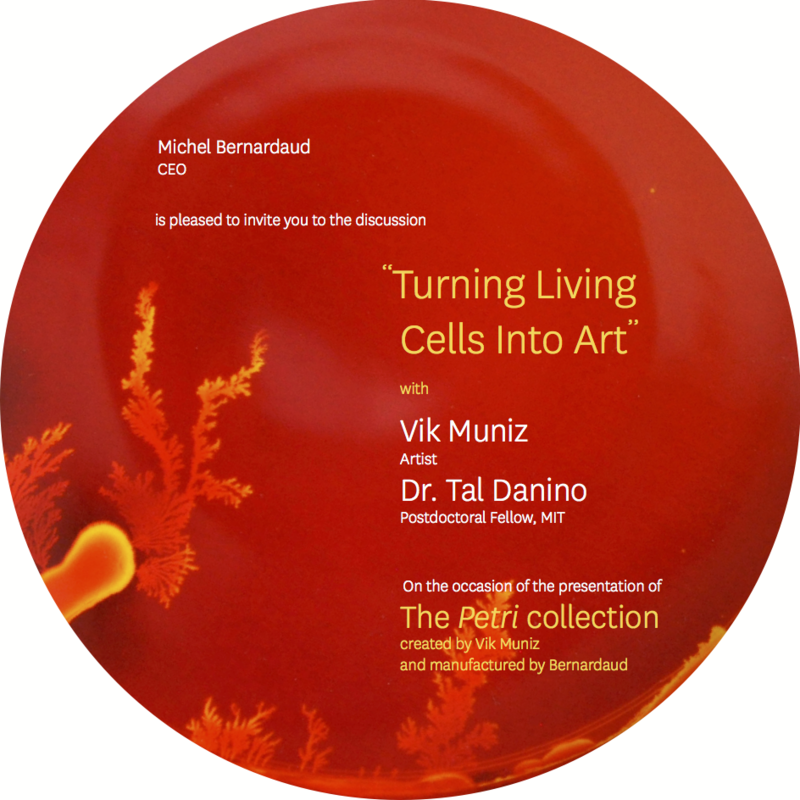 The project began during the Colonies collaboration when Tal kept referring to Petri "dishes" or bacterial "plates", and Vik suggested making actual dinner plates with bacterial patterns. Bacterial species that naturally form fractal-like patterns under certain conditions were chosen that were then created by Bernardaud. This work can be seen at the Bernadaud boutique in New York City and more information about this limited edition can be found in this brochure or purchased here.